This chapter was developed with support from NextFlex. Previously called the Large Area, Flexible Electronics, this chapterÃ¢â‚¬â„¢s name has been changed to reflect the marketÃ¢â‚¬â„¢s adoption of the term Ã¢â‚¬Å“flexible hybrid electronicsÃ¢â‚¬Â� (FHE). The FHE market has been strengthened by the integration of evolutionary technologies (e.g. thin and ultra-thin die) with revolutionary technologies (e.g. additive solution processes). This integration has resulted in an increase of new applications opportunities. 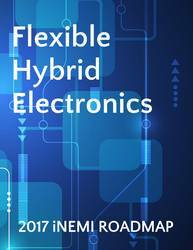 The 2017 Flexible Hybrid Electronics Roadmap chapter attempts to capture these advancement and disruptions by building upon the 2015 edition with a comprehensive update of the various sections. It provides an overview of the most critical technology platforms required for commercial launch and market diffusion. The value of this roadmap is its attempt to provide scientists and engineers with a deep appreciation for the state of the art of the field and to highlight key areas that require additional efforts to be undertaken (e.g., strategic new development projects) to accelerate the growth and establishment of the FHE components, modules and systems enabled market. In addition, the 2017 Roadmap FHE chapter introduces the use of Technology Readiness Level (TRL) and Manufacturing Readiness Level (MRL) methods for assessing technology and manufacturing maturity levels. The use of TRL and MRL will provide guidance to engineers and designers as they develop strategies and long term plans for advanced technology introduction for launch of new products.